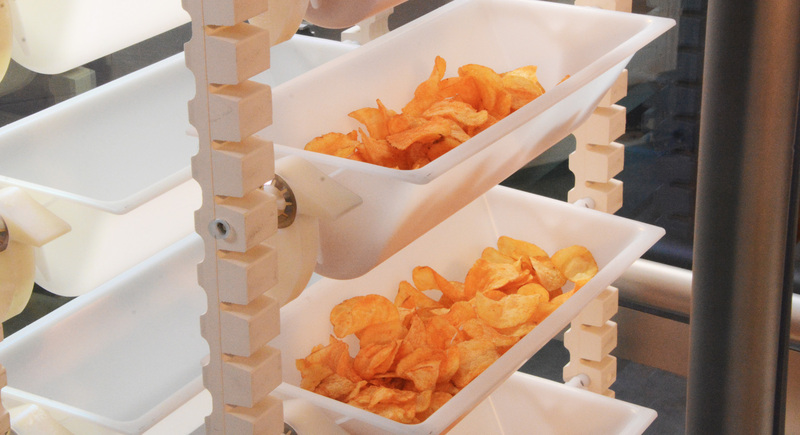 Particularly in the food industry, the advantages of WIESE continuous bucket conveyors and pendulum bucket conveyors are clear to see. By using original WIESE rubber chains, no lubricants are required that could contaminate the conveyed materials. Rubber chains and buckets are available in food-safe versions with certificates according to European (EU directives) and American (FDA) standards. The casing can be designed in accordance with the highest hygienic requirements, such as with a tubular framework without horizontal surfaces and dead spaces. On the pendulum bucket conveyors, the buckets can be removed without tools in a single action to clean them externally. Automatic cleaning stations can also be supplied for cleaning the buckets in all series. Detectable buckets offer the ability to increase your product safety.